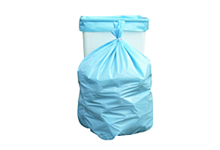 You’ll find 124 stock clear and black trash bags and can liners including heavyweight, linear low-density and high-density polyethylene bags for a variety of uses including residential, commercial and industrial applications. With Poly Bag Central’s commitment to offering only the highest quality materials, you are assured a durable bag whose performance you can rely on. 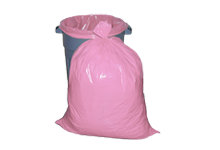 Poly Bag Central offers three types of clear trash can liners to meet your needs. Choose from liners made of linear low density polyethylene (LLDPE), low density polyethylene (LDPE) or high density polyethylene (HDPE). For sizes not listed, call us for a custom quote. Our clear linear low density (LLDPE) liners provide you with one of the toughest bags in the industry. Using Octene, the strongest of the LLDPE, delivers the highest tear and puncture resistant material, combined with features such a star sealed bottom for bags over 31 inches long. This bag’s tubular construction ensures that split sides are eliminated. 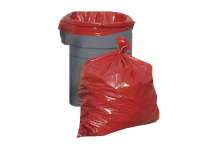 These clear trash can liners are double sealed and available in capacities ranging from 4 gallons to 45 gallons. 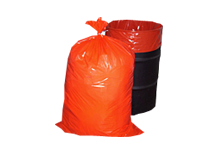 For both heavy industrial and commercial applications, Poly Bag Central also offers its customer’s four types of black trash can liners: high density liners, low density liners, linear low density liners and reprocessed (repro) coreless roll bags. Our black Repro bags are manufactured from pre-consumer recycled polyethylene film. Made in the United States, these trash bags are wound on convenient coreless perforated rolls and carton packed with twist ties. They offer a heavyweight bag at an economical price, making them the ideal addition to any commercial or industrial setting. 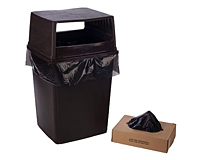 Black repro trash can liners are available in two popular sizes – 45 gallon 2 mil and 60 gallon 3 mil.